WH Calls Head Techie Rap Sheet "Youthful Indiscretion"
Vivek Kundra's "youthful indiscretion" won't cost him his job. President Barack Obama's computer chief was reinstated Tuesday from a leave he was put on after an FBI raid at his old job. At the same time, the White House labeled as a "youthful indiscretion" a misdemeanor theft the man committed at age 21. The 34-year-old computer expert was placed on leave March 12 after the FBI raided the District of Columbia technology office he headed until recently and arrested an employee there and a technology consultant on corruption charges. White House spokesman Nick Shapiro announced the reinstatement of Vivek Kundra as White House chief information officer in charge of federal purchases of computers and other information technology. "Mr. Kundra has been informed that he is neither a subject nor a target of the investigation and has been reinstated," Shapiro said. Subsequently, a check of Maryland court records showed that Kundra pleaded guilty to a misdemeanor theft in 1996. "Vivek committed a youthful indiscretion," Shapiro said. "He performed community service, and we are satisfied that he fully resolved the matter." The business blog Valleywag first reported on Tuesday that Kundra had plead guilty to stealing less that $300 dollars in 1997. He was fined $500, of which $400 the court suspended, according to the court document. He had to pay $155, including court costs. Kundra also received "supervised probation before judgment." That means that he can essentially say that he was not convicted of a crime, according to a Maryland legal blog. Valleywag, part of the Gawker gossip site, matched Kundra's former address with the address on the court document that bore his name. Kundra's lawyer on that case did not respond to Gawker's request for comment. The White House has not commented on the accusation either. Despite taking six hours Tuesday to answer a reporter's questions about Kundra, Shapiro, the White House spokesman said he had not learned what Kundra stole. Asked whether the administration was aware of the guilty plea before Obama named Kundra to the White House job, Shapiro did not answer directly and merely cited Kundra's reinstatement. The misdemeanor case was the latest example of damaging information emerging publicly about one of Obama's choices after he announced their appointment or nomination. A few have withdrawn, including former Sen. Thomas Daschle, nominee for health and human services secretary; Gov. Bill Richardson, commerce secretary nominee, and Nancy Killefer, appointed as the White House's chief federal performance officer. Almost a year after pleading guilty, Kundra's attorney Gary L. Segal applied for reconsideration and got the disposition changed to "probation before judgment," which Segal said is technically not a conviction in Maryland. "Probation before judgment is a disposition available in Maryland for minor offenses like misdemeanors. It means that if he were asked if he had ever been convicted of a crime, he could say 'no,'" Segal said in an interview Tuesday. Judges are often willing to make such a change in disposition once a defendant has complied with probation provisions, according to Segal, who said he had no memory or records of the case but had reviewed the court's computer records of it. A rap sheet does not preclude someone from working for the government. "We consider a number of relevant factors such as the duties of the positions you have applied for, the nature and recency of the misconduct, and any evidence of rehabilitation." It could not immediately be learned from court records what Kundra stole. Gary Cranford, supervisor at the Maryland District Court records center in Annapolis, Md., said the paper case file, which would contain such details, was not in the box that was supposed to contain it. Neither Cranford nor court officials in Rockville were able to locate the file Tuesday. Obama appointed Kundra on March 5. He was put on leave a week later until further details of the FBI case involving his old office could be learned, a White House official said then. The official requested anonymity in discussing personnel matters. Authorities said Yusuf Acar, the acting chief security officer under Kundra in the city's technology office, and technology consultant Sushil Bansal of Dunn Loring, Va., and unnamed others defrauded the city. Court documents alleged Acar approved falsified bills for services that were never delivered to the city and split the money with vendors who submitted the phony bills, including Bansal. Obama spokesman Robert Gibbs would not say whether the White House knew the investigation was under way when it named Kundra. 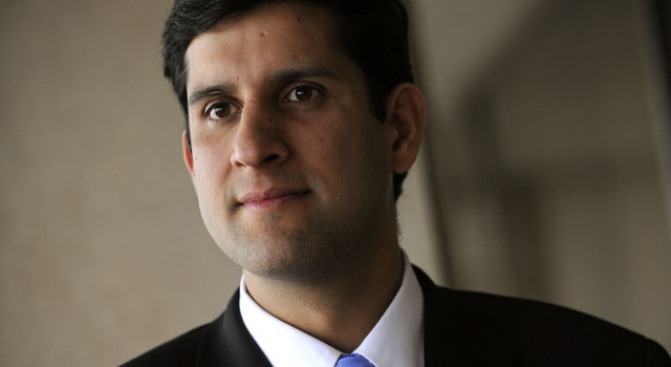 Before becoming the city's chief technology officer, Kundra had been an assistant secretary of commerce and technology in Virginia and president of a technology consulting company. He holds a master degree in information technology from the University of Maryland, and may have been a student when arrested in 1996.